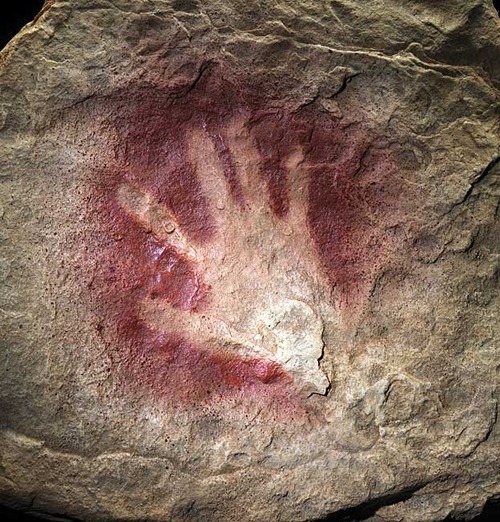 The oldest ‘Portrait’ of Man is a 32.000 Years old Hand Print! Hand prints in on the walls of Chauvet Cave, southern France (width of each hand print is 8cm). The earliest known ‘portrait of man’ was found in Chauvet Cave (south-east of France) – which was discovered 1994. Containing the earliest known cave paintings, the cave art has been attributed to Aurignacian Man (c.35,000 BC) through the use of carbon dating. Interestingly, among the many cave paintings there are quite a lot of hand prints; one of those hand prints became known as ‘the oldest portrait of man‘ – made c.32.000 BC! The oldest portrait of man - a 32.000 year old hand print found in Chauvet Cave, France. Whereas some scholars consider these cave handprints to be early attempts at human artistic self-expression, others believe they must have magical significance. And because the hand prints occur in the innermost parts of caves, on the walls of which primitive men painted pictures of horses, cattle, bears, mammoths, and other animals that roamed Europe in their epoch, it has been suggested that these locations must have been places of prayer and magical ceremonies. Since these were the main tools primitive people had to capture the animals they relied on for sustenance, the hands must have seemed not only mystical, but also symbolic of the entire human being. As Jack Mauduy says, if the hand print is taken to be the hand itself and, by an extension, the entire body, the spirit-strength within the hand can be thought to represent all of the energy stored in the entire being. And today, the capturing of the hand prints of celebrities can in a way be perceived as a likewise ritual as the ancient art from the Chauvet cave in France. 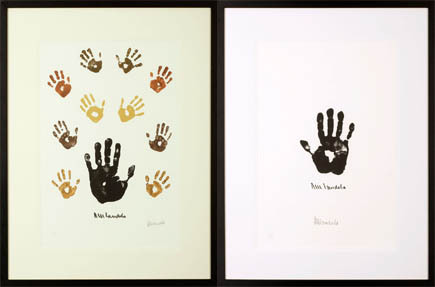 Nelson Mandela’s hand print art collection (see the picture below) is an example of this. Nelson Mandela's hand print art. Religious customs associated with the hands still persist among premitive peoples today. For example, the African Bushmen cut of a finger to symbolize suffering at the loss of a family member or loved one. Other peoples cut of a finger to use a talisman against danger of plague. Plainsmen of New Guinea make hand prints of walls just as primitive man did twenty thousands years ago and cut of fingers to give to the gods in gratitude for good harvest. Interestingly, it seems that, as time passed, primitive people stopped performing bodily mutilation of this kind and resorted to finding mystical qualities in hand print, which came to replace severed digits and hands in their religious ceremonies. Hand print of a Japanese Sumo wrestler. The same psychology maybe traceable in old Japanese customs of displaying on walls hand prints of Sumo wrestlers as charms and good-luck signs. But there many likewise habits are found all over the world. Muslims, for example, use such a charm that looks like a hand with the five fingers extrended. And in some parts of Arabia, people make good-luck signs over the entrances to their houses by dipping their hands in sheep’s blood and pressing them against the wall. In brief, since the dawn of civilization, human beings, not only in Europe, but also in Asia and Africa, have been fascinated by the mystical nature of the hands. Hand print of 'James Bond 007' - Sir Sean Connery, Leicester - UK. The ancient Indians were the first to conceive the idea of telling a man’s ‘fate’ from his hands (3000 BC), and palm reading in New Delhi is still a classic source of entertainment for Western tourists. Then the ancient Chinese became known for being the first who associated man’s health with his hands (2500 BC), a palm reading in Hong Kong will nearly always include a reading of your ‘health’. 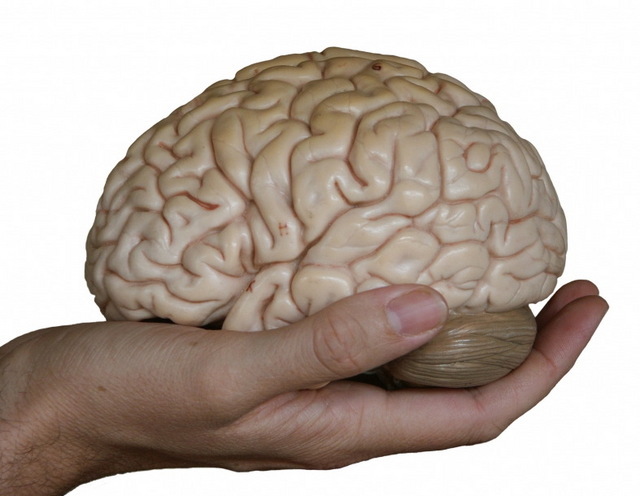 And the Greeks were probably the first who associated man’s psychology with his hands (350 BC). And maybe therefore it is not really surprizing that a palm reading in London will often include a reading of your ‘personality’! How to diagnose Down syndrome from the hands only? 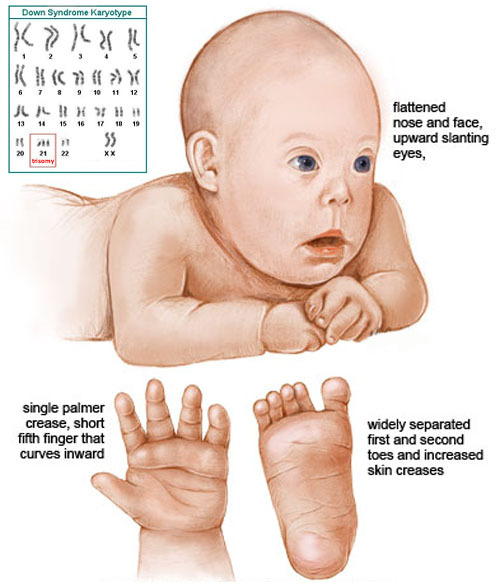 Physical characteristics in Down syndrome. Down syndrome (trisomy 21) is known as a genetic condition in which the person has 47 chromosomes instead of the usual 46. Down syndrome symptoms vary from person to person and can range from mild to severe (often featured with medical problems). However, children with Down syndrome have a widely recognized physical appearance. The hand characteristics in Down syndrome are very typical, and it is even possible to make a very reliable hand-diagnosis (with an accuracy beyond 99%). Pregnant women can be screened for various complications during pregnancy. Many standard prenatal screens can discover Down syndrome, so sometimes the condition is already known before birth. But when the condition has not yet been identified before birth, in most cases the typical physical characteristics are recognized shortly after birth through the face. And then doctors will make a quick inspection of the hands & feet in order to find out if further diagnostic tests are required. The hand in Down’s syndrome varies significantly from the common hand. The most significant features manifest in a combination of the dermatoglyphics, the hand shape & the finger morphology. Some of the typical hand characteristics in Down’s syndrome are summarized in the picture below – many more details are summarized in the article: how to make a hand diagnosis for Down syndrome? 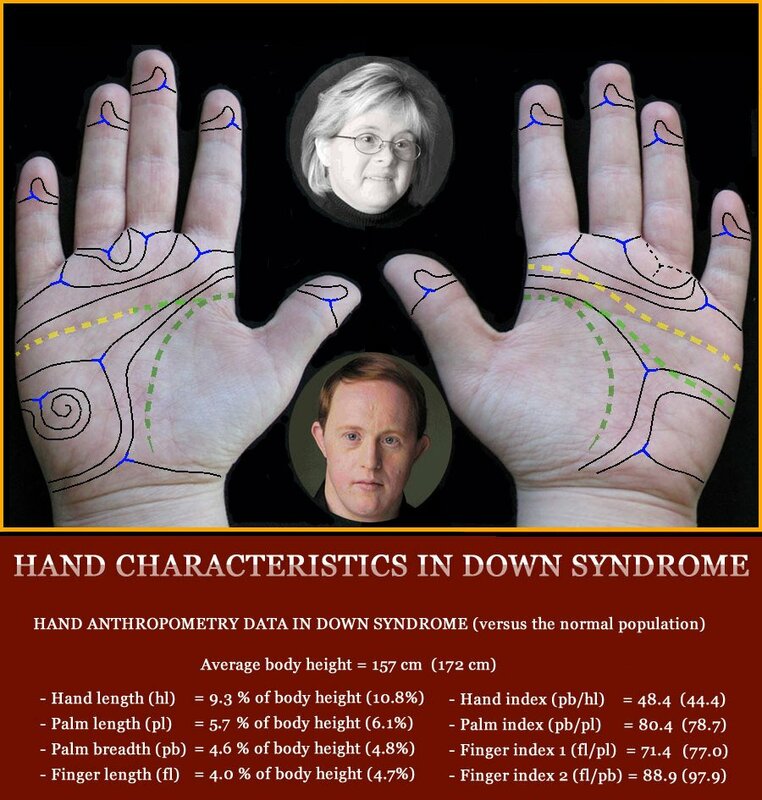 The hands of people who have Down syndrome are typically smaller than the common hand and they are featured with uncommon fingerprint distributions & palmar dermatoglyphics. Usually the palms of these people are short, featured with a high positioned ‘axial triradius’ (the delta in the dermatoglyphics of the hypothenar – in palmistry / palm reading known as the mount of moon), and a majority also has a simian line or Sydney line. The fingers are typically featured with ulnar loop fingerprints (possibly a radial loop on the ring finger and or pinky), short fingernails, thumb & pinky are typically very short, and especially the pinky finger can be featured with other minor physical anomalies (such as: clinodactlyly or a missing interphalangeal crease). HAND ANTHROPOMETRY – From Leonardo Da Vinci to NASA & US army! 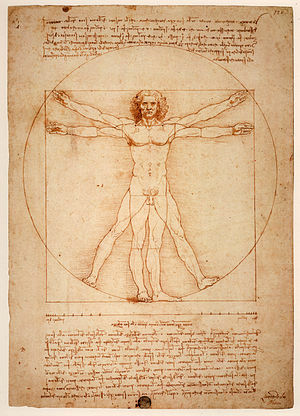 Historically, Leonardo da Vinici’s ‘Vitruvian Man’ can be described as one of the earliest examples of anthropometry. The drawing was created by Leonardo da Vinci around the year 1487, and is accompanied by notes based on the work of the famed architect, Vitruvius. The drawing, which is in pen and ink on paper, depicts a male figure in two superimposed positions with his arms and legs apart and simultaneously inscribed in a circle and square. The drawing and text are sometimes called the Canon of Proportions or, less often, Proportions of Man. Leonardo da Vinci’s comment about the proportion of the average hand was quite right, but the field of anthropometry has later developed more precise methods in order to describe the most important individual variations concerning the human body. 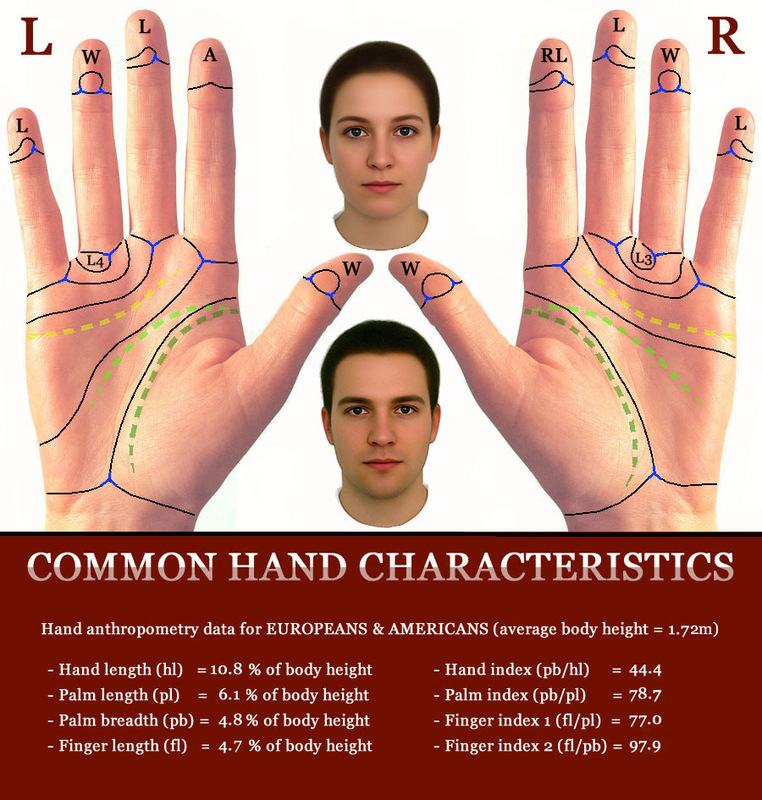 Various sources of anthropometric hand data indicate the average hand length is close to 11% of body height (usually slightly smaller). Today, anthropometry plays an important role in industrial design, clothing design, ergonomics and architecture where statistical data about the distribution of body dimensions in the population are used to optimize products. 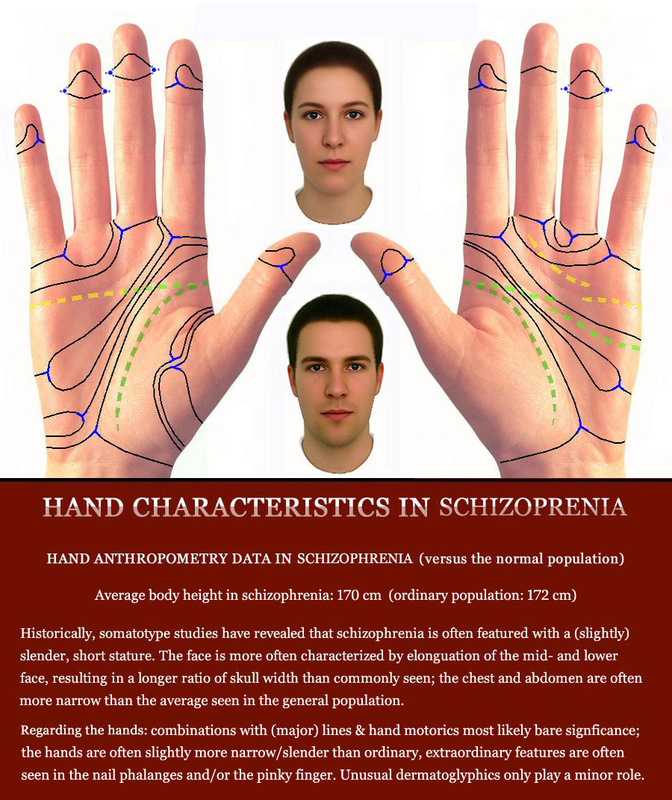 In the last decade of the 20 century reports became available developed by the NASA & the US army – which include data for at least 20 characteristics of the human hand shape, including e.g. hand length, hand breadth & finger length. The data in the picture above represents static human physical characteristics of the adult hand, presented in 2000 by the Department of Defense Human Factors Engineering Technical Advisory Group. The picture below presents at the bottom some average data based on German, UK & American populations – which provide useful ‘points of reference’ in the perspective of biometry & Multi-Perspective Palm Reading. VIDEO: The Evolution of the Human Hand! The Youtube video titled: ‘Evolution of the human hand’ – displays a detailed picture of what modern science knows (based on Darwin’s evolution theory) about how the structure & shape of the human hand changed & developed during the last 1.8 million years in the evolution of human kind. The video demonstrates how the ‘early’ humanoid hands (and primates) are typically featured with 3 or more ‘complete transverse creases’ (multiple simian lines), which are positioned horizontal in the hand + two major vertical lines. While at the end of the video displays a typical human hand featured with only 2 curved, oblique positioned ‘primary palmar creases’ (heart line and head line) + one major vertical line (life line). Many other fascinating details about the evolution of the human hand are described in the work of physician John Napier, titled: ‘Hands‘. 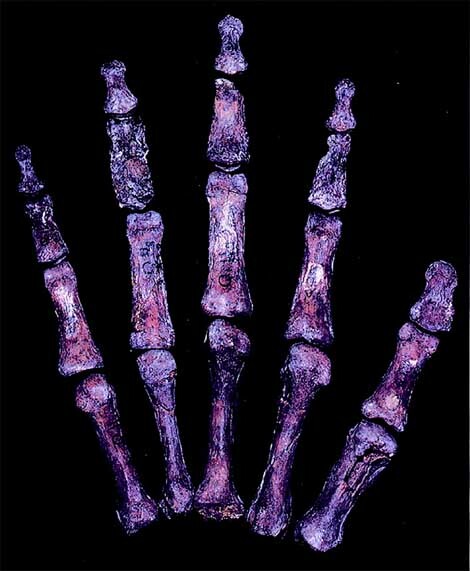 The hand of early hominids (30.000 years old). The hand of Neanderthals (300.000 years old). 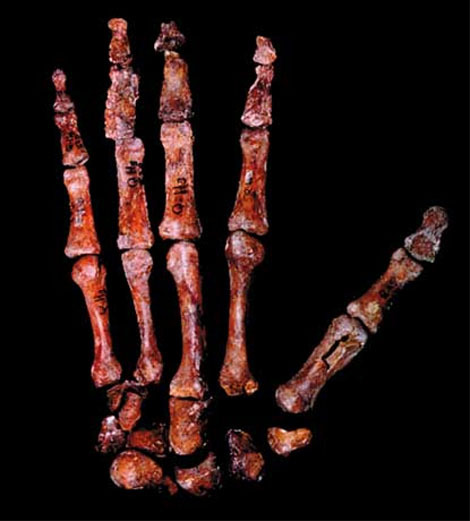 The hand of 'Ardi' (4.4 million years old). How to classify the palmar lines: the simian line, Sydney line & the Suwon crease! The study of the palmar lines [folding creases] traces back to the ancient civilisations of the Chinese and Indians as early as 3,000 years B.C. Historically the palmar lines have been adopted as the most important ‘tool’ of the classic Indian palmist with the purpose for ‘the guidance of humanity’. This explains why in all regions of the world the palmar lines became synonymous with the stigma of fortune telling (advocated by so-called ‘predictive palmistry’) – and subsequently debarring the hand lines from the scientific courts. However, since the end of the 19th century the hand lines have been adopted by scientific researchers for other purposes, including: anthropological classification, personal identification (though the fingerprints are more well-known for this purpose), and hand lines also have a diagnostic purpose! • COMMON LINES: The heart line & the head line typically manifest as 2 unconnected lines, and only in human hands these lines typically do not cross the full palm (in the primate palm there are usually mulitiple horizontal lines which cross the full palm). • SYDNEY LINE: The Sydney line can be recognized by the presence of an extended head line which crosses the full palm, combined with the presence of a normal heart line (both lines are required not to connect/fuse with eachother). 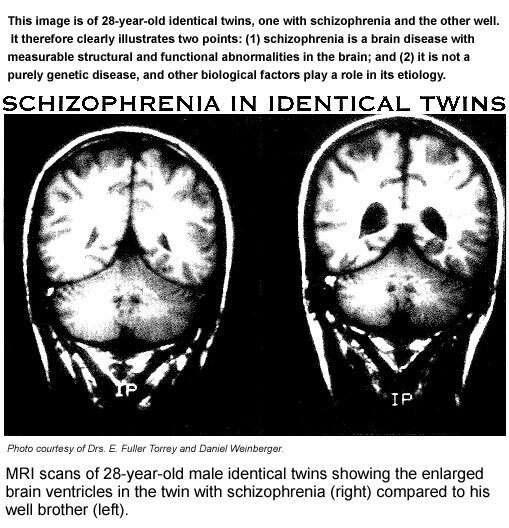 NOTICE: From a scientific point, in medical science the Sydney line has been recognized in medical science as a ‘minor physical anomaly’ (MPA), and it became also known as a typical marker for e.g. 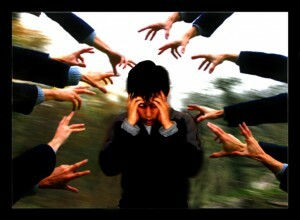 the hand in Down syndrome, the hand in fragile-X syndrome, the hand in psoriasis & the hand in Schizophrenia. The name‘Sydney line’ was introduced in 1968 by Australian researcher S.G. Purvis-Smith who reported a high prevalance of Sydney lines in patients with congenital rubella. • EXTENDED HEART LINE: The extended heart line can be recognized by the presence of a very long heart line which crosses the full palm, combined with the presence of a normal head line (both lines are required not to connect/fuse with eachother). NOTICE: From a scientific point of view there is not much know about the extended heart line. • SIMIAN CREASE: The simian crease can be recognized by the presence of a fusion between the head line and the heart line – resulting in the impression that one of both lines is missing. NOTICE: From a scientific point, in medical science the simian line has been recognized as a ‘minor physical anomaly’ (MPA), and it became also known as a typical marker for e.g. many syndromes (including Down syndrome) and many diseases such as the hand diabetes mellitus & the hand in rheumatoid arthritis. The name simian line was introduced in 1877 by French physician Paul Broca who described it as an unusual characteristic for the human hand. • SUWON CREASE: The Suwon crease can be recognized by the presence of two complete head lines (not a splitting head line, nor an interrupted head line), and the upper head line fuses/connects with the heart line. 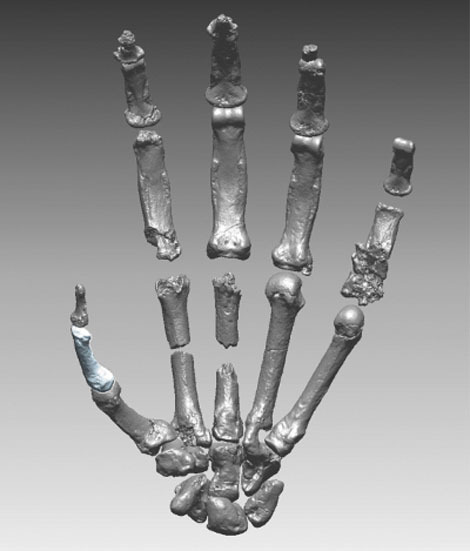 NOTICE: The history of the Suwon crease is still very young: it was first described in 2010 by Korean researchers, who found it only in 0.7% of a large Korean sample of 3.532 male hands (in the 1664 female hands it was never observed). An advanced definition of various types of palmar creases.